Multinucleated giant cells (MNCs) form an integral part of numerous bone and soft tissue tumors, tumor-like lesions and are often associated with granulomas of immunological and nonimmunological origin., The significance of the presence of giant cells is variable and depends on the lesions in which they are present. The diagnosis of these lesions is based on the clinical history along with radiological evaluation and histological findings. However, the differentiation of the giant cell lesions using conventional histological methods cannot be made with certainty, as they exhibit a variety of morphological appearances, with features of osteoclast-like giant cells that closely resemble each other. Often, the distinction between the benign MNCs and malignant tumor giant cells are also faced with difficulty. MNCs, epithelioid cells, and macrophages and its derivatives are the most characteristic histological features that dictate the granuloma formation. MNCs represent highly stimulated cells of macrophages lineage at a terminal stage of maturation and are also considered to be a phagocytic response to hemorrhage in chronic reparative granulation tissue. The histological hallmark of giant cell tumors (GCT) is the presence of innumerable MNCs with variable number of nuclei. The mononuclear cell often shows variable degrees of cytological atypia and may be mitotically active which may be especially prominent in areas adjacent to previous hemorrhage and fibrin deposition. The presence of various types of giant cells depends on the lesions in which they are present which are difficult to be diagnosed under routine histological techniques. Hence, special techniques such as immunohistochemistry can be used for a better diagnosis and understanding of the origin of various giant cells using various markers of immune response (Ir) like human leukocyte antigen-DR (HLA-DR) and those expressed on monocytes and macrophages like CD 68 and leukocyte common antigen (LCA). Human Class II major histocompatibility antigens (HLA-DR antigens) play a role for regulation of T-cell dependent Irs. They are found primarily on B lymphocytes, monocytes and a variety of other somatic and tumor cells, and they contribute to the enhancement or amplification of the Ir through lymphocyte coordination and antigen presentation. CD 68, a selective marker for human myeloid cells, is expressed abundantly in macrophages although low levels are present in other cells. CD 68 plays a role in phagocytic activities of tissue macrophages, both in intracellular lysosomal metabolism and extracellular cell-cell and cell-pathogen interactions. The osteoclast-like giant cells show positive reactivity for CD 68, whereas the mononuclear cells are negative. CD 45, also called the LCA, is a protein tyrosine phosphatase (PTP) expressed on the cell membrane of all leukocyte progeny of the hemopoietic stem cell and has previously been reported on osteoclasts and macrophage polykaryons. CD 68 positivity enables in distinguishing the giant cells and histiocytes from the stromal and tumor cell elements in giant cell lesions. It also demonstrates cytoplasmic staining in osteoclasts, macrophage polykaryons, and giant cells from the bone and soft tissue giant cell lesions. However, the membrane staining is usually demonstrated only with LCA. The absence of HLA-DR reaction in the osteoclasts and GCT of bone and giant cell reparative granulomas could be used to differentiate from macrophage polykaryons and giant cells in other giant cell lesions of bone and soft tissue. Considering all the above facts, the present study was designed to evaluate and analyze the expression of LCA, CD 68, and HLA-DR in variable giant cell lesions of different characteristics namely giant cell granuloma (central and peripheral) and tuberculus granuloma, respectively, as they are commonly seen in the head and neck region and GCT of long bones for the controversy of its existence and determine their antigenic phenotype of giant cells in order to characterize the lesion. Formalin fixed paraffin embedded biopsies of giant cell granuloma, GCT of long bones, and tuberculous granuloma cases were retrieved from the laboratory archives of Saveetha Dental College, Chennai and Government Medical College, Calicut. The diagnosis in each case was made based on the clinical and histopathological findings. The methodology was approved by the Institutional Review Board, and ethical clearance was obtained from Saveetha Dental College, Saveetha University, Chennai. The study group consisted of 10 cases of GCT of long bones, tuberculous granuloma, and giant cell granuloma (5 cases comprising of the intra-osseous variant and 5 cases of extra-osseous variety). For immunohistochemical study, 3 µm sections were cut from formalin fixed paraffin embedded blocks, mounted on gelatin-coated slides. The sections were deparaffinized in xylene, dehydrated in alcohol, and rinse in distilled water. Antigen retrieval was performed using heat induced-epitope retrieval in citrate buffer (pH 6.0) for 10 min in a pressure cooker. Following which endogenous peroxidase was blocked for 5 min, protein block for 5 min. Sections were then incubated with mouse monoclonal antibody for CD 68 (Clone KP 1), HLA-DR (Clone LN 3) and CD 45 (Clone PD 7) (Biogenex, San Ramon, California) and incubated for 60 min. Detection was performed using Novolink Min Polymer Detection System (Leica Microsystems, Newcastle, UK). The sections were then counterstained with Mayer's hematoxylin. The slides were then dehydrated and mounted. Negative and positive controls were used in each run. Tonsil and spleen sections were used as a positive control for HLA-DR, LCA, and CD 68, respectively. 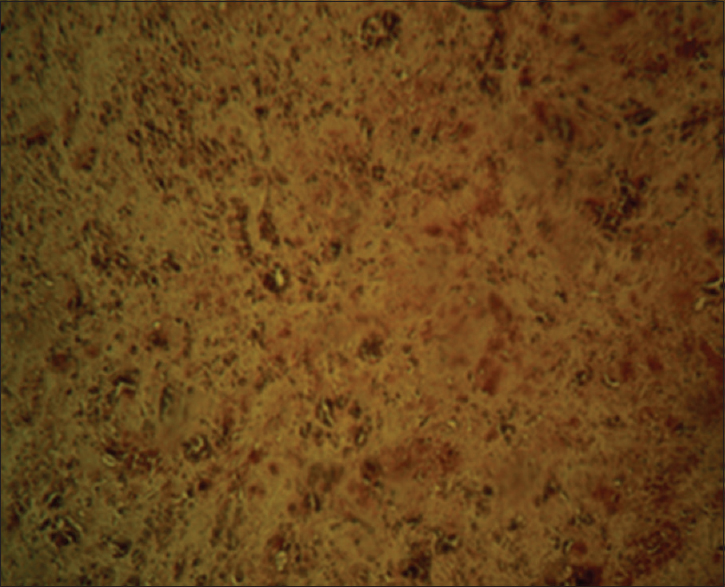 Negative controls were achieved by performing the staining procedures with omission of the primary antibody. Eight high-power (×400) fields were randomly observed in each slide, commencing with thefirst representative field on the left hand side of the section being counted, moving the stage to the next field and then continuing with measurement of alternative fields. The presence of brown colored end product at the site of target antigen was indicative of positive reactivity. The cells with a clearly defined immunostaining as compared with the positive controls were counted. The count was divided by the total number of cells in each field. The mean of the eight fields was the marker expression estimation for each sample. Furthermore, each field was evaluated for the proportion of stained cells and the intensity of overall staining. The intensity of staining of the epithelium was assessed as: -, negative; +, mild; ++, moderate; or +++, intense. Data were analyzed with the use of SPSS software (version 11.0.05, SPSS Inc, Chicago, Illinosis, USA). Pearson's χ2-test was performed to compare the expression pattern of CD 68, LCA, and HLA-DR between the groups. Difference with a probability value of 0.05 (P < 0.05) was considered as statistically significant. There was uniform intense positivity of giant cells in eight cases of GCT whereas two cases showed moderate to mild positivity of the giant cells [Figure 1]. Four cases of central giant cell granuloma (CGCG) and peripheral giant cell granuloma (PGCG) showed a uniform intense and specific positivity of the giant cells and one case showed moderate to mild positivity of the giant cells [Figure 2]. 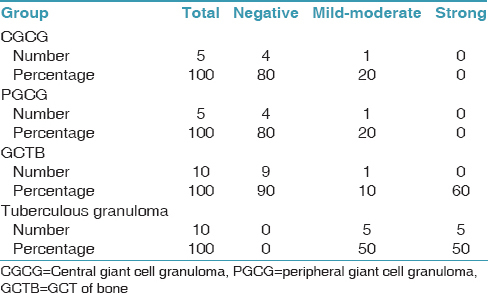 Six cases of tuberculous granuloma showed a uniform intense and specific positivity for giant cells and three cases showed moderate to mild positivity of the giant cells and the remaining one case was negative [Table 1] and [Figure 3]. Six cases of GCT showed a uniform intense and specific positivity of the giant cells and four cases showed moderate to mild positivity of the giant cells [Figure 4]. Four cases of CGCG and PGCG showed a uniform intense and specific positivity of the giant cells and one case showed moderate to mild positivity of the giant cells [Figure 5]. Five cases of tuberculous granuloma showed a uniform intense and specific positivity of the giant cells and four cases showed moderate to mild positivity of the giant cells and the remaining one case was not reactive [Table 2]. All the 10 cases of central GCT showed the negative reactivity of the giant cells and three cases showed moderate positivity for the mononuclear cells [Figure 6]. All the five cases of CGCG showed negative reactivity of the giant cells and four cases showed moderate positivity for the mononuclear cells [Figure 7]. 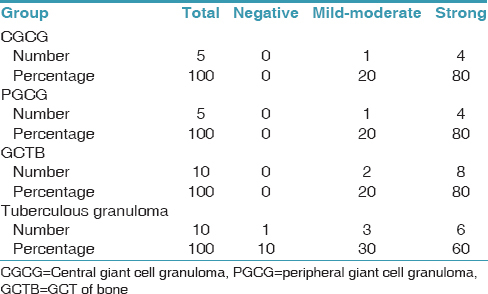 Five cases of tuberculous granuloma showed a uniform intense and specific positivity of the giant cells and five cases showed moderate to mild positivity of the giant cells [Table 3] and [Figure 8]. The result values were also found to be statistically significant (P = 0.001). MNCs may arise from the fusion of nonreplicating monocytes or from the mitotic and a mitotic division of monocyte nuclei in the absence of cellular division. They are also associated with granulomas arising from immunological and nonimmunological inflammatory reactions and they form an integral part of the host Ir to chronic infectious diseases. Giant cell lesions are difficult to differentiate using conventional histological methods as they can exhibit a variety of morphological appearances and with the common feature of numerous osteoclast-like giant cells may closely resemble each other. In some cases, even distinction between benign MNCs and malignant tumor giant cells cannot be made with certainty. The significance of the presence of giant cells is variable and depends on the lesions in which they are present. These cells are pathognomonic in certain lesions, such as GCT, CGCG, and PGCG, but not pathognomonic in some lesions like tuberculosis (TB), cherubism, aneurysmal bone cyst, fibrous dysplasia, and Paget's disease. Hence, special techniques such as immunohistochemistry can be used for understanding the origin of various giant cells using markers of Ir like HLA-DR and those expressed on monocytes and macrophages like CD 68 and LCA. CD 68 monocyte-macrophage lineage marker has been often used in the investigation of giant cells. It is a selective marker for monocyte-macrophage lineage. They are specific to lysosomes, and they bind to tissue and organ-specific lectins or selectins, allowing homing of macrophage subsets to particular sites. It is also used as a marker of histiocytes and histiocytic tumors. CGCG is widely considered as a nonneoplastic lesion. 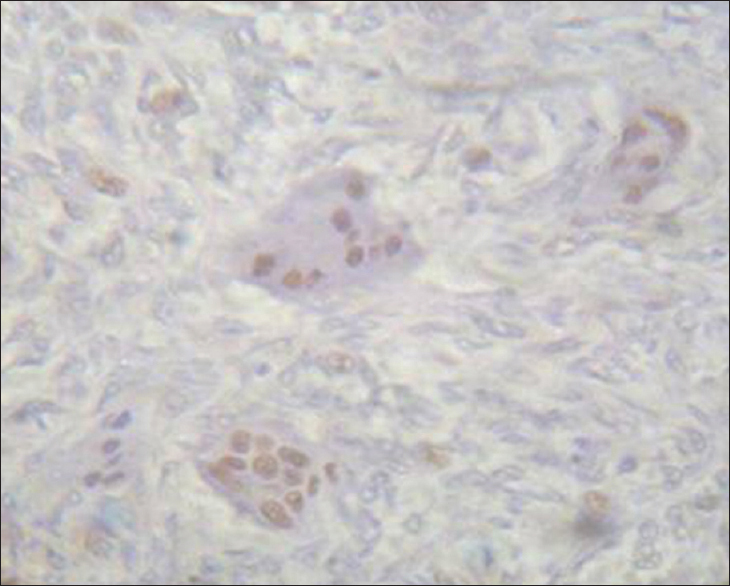 The osteoclast-like giant cells and macrophage polykaryons usually show positive reactivity for CD 68. The results obtained in our study using CD 68 showed that of the 5 CGCG cases, there was intense positivity for CD 68 in cytoplasm of MNCs and macrophages in four cases (80%) and moderate positivity in one case (20%). Studies indicate that CGCG derived giant cells expressed phenotypic characteristic typing of osteoclast as they were tartrate-resistant acid phosphatase(+), vitronectin reception(+), and responsive to calcitonin. These findings have indicated that giant cells in CGCG are osteoclast-like and formed from monocyte/macrophage precursors that differentiate into osteoclasts under the influence of RANKL expressing mononuclear stromal cells found in this lesion. Macrophages appear to play a secondary role in CGCG which attributes to the study by El-Mofty and Osdoby in which CGCG demonstrated similar staining characteristics for histiocytic markers as macrophages. CGCG also exhibits characteristics of osteoclast phenotype and has an ability to carry out lacunar bone resorption as suggested by Tiffee and Aufdemorte. CD 68 expression pattern in CGCG in our study suggest that they are osteoclasts that are derived from monocyte macrophage lineage that supports the study of Liu et al. which concludes that the giant cell component in giant cell granuloma of the jaw is osteoclast-like and it is this cellular component, which produces the osteolysis associated with the growth of the lesion and the presence of CD 68 positivity in mononuclear cells and giant cells indicates histiocyte/macrophage origin. PGCG is a common tumor-like growth in the oral cavity with controversial etiology. The expression of RANKL and OPG in PGCG supporting the osteoclastic nature of giant cells indicates a monocyte macrophage lineage. Our findings correlated with the literature, confirming the fact that MNCs and macrophages show strong CD 68 expression. GCT is one of the most obscure and intensively examined tumors of bone. GCT of bone is an enigmatic osseous neoplasm that is histologically benign but clinically shows local aggression and metastatic potential. The question whether true GCT occurs in the jaw is still argued. A true GCT of bone should contain a large number of giant cells in a diffuse distribution in a background of mononuclear cells. Based on the literature review, our study demonstrates that the cells with CD 68 expression in GCT were derived from monocyte macrophage lineage. The derivation of giant cells in GCT of bone (GCTB) from osteoclasts has been demonstrated by Mii et al. and Goldberg et al. The mononuclear and giant-cell components of GCTB have similar phenotypic features and the accumulation of osteoclasts in these giant-cell-rich tumors occurs by a RANKL-dependent process as indicated by Lau et al. Essential components of a tuberculous granuloma are collections of modified macrophages, termed epithelioid cells usually arranged with a surrounding zone of lymphocytes. Macrophages in infectious granulomas are commonly further modified to form MNCs commonly the Langhans type. The tempo at which granulomatous inflammation develops can vary considerably and depends upon both the inciting agent and the state of the host. Several findings suggest that CD 14 (++)/CD 16(- -) monocytes are fused to form Langhans giant cells (LGCs) by muramyl dipeptide derived from granulomatous disease causing pathogens with inflammatory mediators such as interferon-γ (IFN-γ), interleukin (IL-3), and GM - CSF. Interleukin-4 is a potent human macrophage fusion factor and different regulation of macrophage fusion by interleukin-4 and IFN-gamma may lead to morphological variants of MNCs. Our results suggested that all the cases under the three groups CGCG, PGCG, and GCT showed positivity for CD 68 and expression of CD 68 in LGCs in tuberculous granuloma suggesting that they belong to macrophage lineage. However, there was no statistical difference P = 0.851 (P < 0.05) of expression of CD 68 among the different groups. The results of our study, drawn parallel with literature proved that giant cells present in the entire three groups (CGCG, PGCG, and GCT) showed CD 68 expression suggesting that all the giant cells originate from mononuclear macrophage lineage and considering their clinical behavior of osteoclast type. 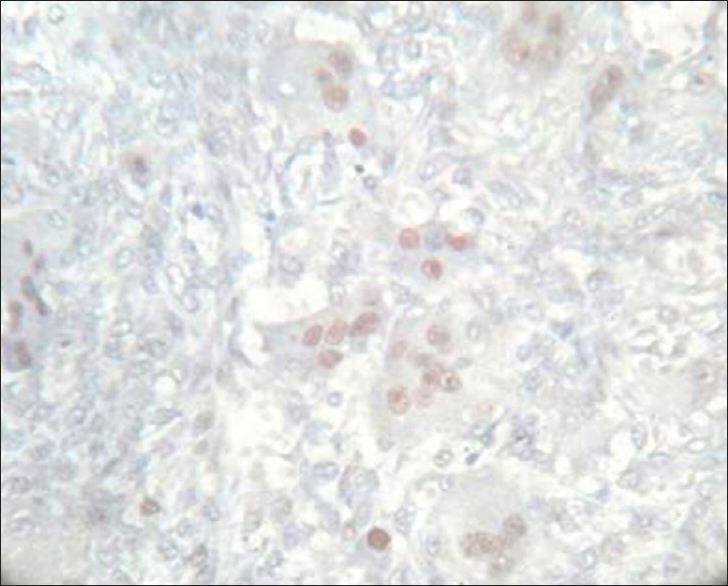 Expression of CD 68 in Langhans cells in tuberculous granuloma suggests that they belong to macrophage lineage. CD 45 is commonly called the LCA, expressed on the cell membrane of all leukocyte progeny of the hemopoietic stem cell and has been reported on osteoclasts and macrophage polykaryons. CD 45 is the prototypic receptor-like PTP and an essential regulator of signal transduction pathways in immune cells. CD 45 expression is seen on the cell membrane of all leukocyte progeny of the hemopoietic stem cell and mainly seen in osteoclasts and macrophage polykaryons. The results of our study thus emphasize the concept of monocyte–macrophage lineage origin that supports the literature findings of Athanasou et al. and Lim and Gibbins. The presence of LCA on giant cells supporting the hypothesis that these cells are of mononuclear phagocyte origin has been demonstrated by Brecher et al. and Flanagan and Chambers, Chambers et al. Our results in tuberculous granuloma using CD 45 suggest the origin from monocyte macrophage lineage that correlates with studies done by Doussis et al. Immunohistochemical analysis of CD 68 and CD 45 in CGCG and PGCG demonstrated similar expression pattern of both the markers suggesting that the two lesions may be of the same origin. Lim and Gibbins based on his study to determine the nature of giant cells demonstrated similar staining pattern with LCA and MB1 and suggested an osteoclastic origin. Consequently, our findings also were in accordance with the literature and immunohistochemically the two entities, i.e., PGCG and CGCG cannot be differentiated as they show similar pattern of expression for both CD 68 and CD 45. Hence, from these previous studies, it can be concluded that giant cells in PGCG, CGCG, and GCT share a similar origin. In the previous year's giant cell granuloma was termed as GCT and it was thought that GCT of jaws was similar to the lesion of long bone. The occurrence of a true GCT in the jaws was uncertain and controversial. Certain authors believed that CGCG and GCT form a continuous spectrum. Whether giant cell granuloma of the jaw represents the benign end of the spectrum of GCT remains a matter for speculation. Jaffe, he believed that giant cells in giant cell granuloma represented a phagocytic response to hemorrhage and trauma and that GCT was extremely rare in jaws and, therefore, separated giant cell granuloma of the jaw from GCT of bone that was later reconfirmed by Austin et al. Many of the previous histologic observations have been based on subjective criteria and more recently, efforts have been made to more objectively compare the giant cell granuloma with the GCT. Hanaok based on his electron microscopic findings revealed that the fine structure of the giant cells was indistinguishable from that of osteoclasts or of giant cells from other lesions. The giant cells appeared to form by fusion of mononucleated stromal cells and to increase in size and number of nuclei by merger with additional stromal cells. Giant cells did not show evidence of division and, therefore, could not be properly considered the principal tumor cell. Mononuclear stromal cells showed division, fulfilling a criterion of neoplasia and are probably the main tumor cells. The resemblance of many stromal cells to macrophages, sinusoidal lining cells, and cells of lymphoid series suggested that the tumor may originate from these cells. Later Auclair et al. stated that the two lesions were not separate entities but that they represent a continuum of a single disease process modified by the age of the patient, site of occurrence and possibly by other factors. It is evident that the controversy surrounding the relationship between the GCT and giant cell granuloma of jaws remain unresolved. However, the prevailing concepts in the 1950s that the jaw lesions were separate and distinct from the giant cell lesions elsewhere has now shifted to a more moderate view that allows the possibility of overlap. Meng et al. suggested that MNCs probably originate from CD 68-postive round mononuclear cells, which are recruited from monocyte-macrophage system based on immunohistochemical findings. The histochemical, immunocytochemical, and tissue culture observations support the concept that giant cell granuloma of the jaws and GCT of long bones are related lesions. Nevertheless from our results, we were also able to relate between giant cell granuloma and GCT as both demonstrated similarity in their immunohistochemical expression for CD 68 and CD 45 suggesting that giant cells present in these lesions were of the same lineage and giant cell granuloma of the jaw could be an extension of the GCT of long bone. It appears that lesions may represent a spectrum of disease processes that histologically and immunohistochemically manifest in a similar way. HLA-DR antigens are (human Class II major histocompatibility antigens) necessary for regulation of T-cell dependent Irs and are normally expressed on the surface of B cells, activated T-cells, macrophages, Langhans cells, and endothelial cells. These antigens have also been detected on several types of nonlymphoid cells. MNCs werefirst described in pulmonary granulomas in TB and were then found to occur in a broad variety of chronic inflammatory conditions and are now known as a hallmark of granulomatous responses. MGC formed in response to intracellular pathogens are believed to be an essential component of normal host defense mechanisms. Our results also showed negative expression of HLA-DR in PGCG, CGCT, CGT and an intense positive staining was seen with tuberculous granuloma. Hence, granulomatous inflammatory lesions showed more intense immunoreactivity than other giant cell lesions with HLA-DR and were also statistically significant (P = 0.001). Zarbo et al. 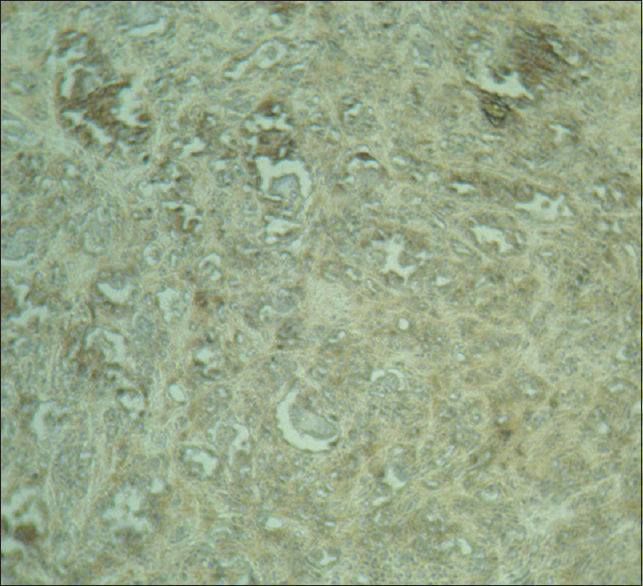 evaluated the immunohistochemical expression pattern of HLA-DR in PGCG, CGCG, CGT, TB node, and Crohn's disease. Intense staining of giant cells was generally found in granulomatous inflammatory lesions, in TB lymphadenitis and in Crohn's disease whereas giant cells in other giant cell lesions were negative. Williams and Williams defined granulomatous inflammation as a special variety of chronic inflammation in which cells of the mononuclear phagocyte system are predominant and take the form of macrophages, epithelioid cells, and MNCs. Hence, the giant cells in TB cases showed positivity for all the markers of our study namely CD 68 and CD 45 which are macrophage markers and HLA-DR which is a Class II major histocompatibility complex (MHC) molecule essential for antigen presentation to CD 4 T-cells which is the master cell of immunity in granulomatous inflammation such as TB. Zulma and James suggested that the process of granuloma formation is thought to be a critical step in the physiological delayed Ir that stops the spread of noxious and infectious microorganisms. Russell et al. proposed that mononuclear phagocytes are the principal host cells for Mycobacteriumtuberculosis and infected cells have diminished the capacity for MHC Class II restricted Antigen presentation and costimulation of Th cells. These defects appear to be related to reduced expression of Class II molecules by infected macrophages. During both the innate and acquired Irs, Class II expression by APCs is up-regulated by IFN-γ. However, the intracellular infection has been shown to impair macrophage responses to IFN-γ and the mechanisms by which M.tuberculosis interferes with enhanced Class II expression in response to IFN-γ are not understood. Recent studies indicate that transcription of MHC Class II genes in response to IFN-γ is regulated by the MHC Class II transactivator (CIITA) 4 protein. Thus, CIITA controls expression of multiple gene products involved in Ag presentation. Barnes revealed that Immunoelectron microscopy studies showed that the vacuoles in which M. tuberculosis reside in human monocyte-derived macrophages are positive for MHC Class II molecules (HLA-DR). However, in these studies, the macrophages had to be activated with IFN-γ before infection to up regulate HLA-DR expression to levels that could be detected by electron microscopy. Hence, only activated macrophages show an increased expression of HLA-DR, which is the hallmark of TB. Sable et al. in their study compared the immunophenotype of peripheral blood mononuclear cells and BALMCs in patients with pulmonary TB directly and detected higher frequencies of CD 4 CD 45R0 memory T-cells and HLA-DR activated T-cell. They found that in active pulmonary TB, antigen-specific T-cells are therefore expanded among other lymphocytes. They concluded that antigen-specific T-lymphocytes are specifically concentrated at the site of the infection in active TB, which helps in the expression of HLA-DR.
Our results showed intense positivity of HLA-DR in tuberculous granuloma that suggests the high expressivity of HLA-DR molecules, a part of Class II MHC molecule, for the presentation of the microbial antigen to CD 4 helper cells. HLA-DR molecules are known to be up-regulated in response to infection. Antigenic cross-reactivity or mimicry is known to exist between infectious organisms and a given HLA antigen, a phenomenon termed as "molecular mimicry." This means that common antigenic determinants are shared by HLA-DR and the bacteria. They act as receptors for bacteria. The MHC genes may be physically close to the chromosome region that carries a gene conferring susceptibility or resistance to a particular disease. HLA antigens could influence particular Irs, acting as Ir genes. Many studies also have shown that association of HLA-DR antigen with susceptibility to TB also its influence with the severity of TB. Brahmajothi et al. found significantly increased frequency of HLA-DR in TB, which have revealed HLA-DR association with higher susceptibility to TB. Therefore, HLA-DR antigen could serve as indicators of susceptibility to the development of active TB. In addition, HLA typing of TB patients could aid the detection of persons with potentially unfavorable prognosis if, for instance, the presence of the HLA-DR antigen is related to defective Irs in TB. HLA-DR plays an important role in specific Ir against pathogens. This host susceptibility genetic factor associated with susceptibility to TB, which serves as a genetic marker to understand predisposition for the development of the disease. Based on immunohistochemical analysis with the HLA-DR, CD 68 and CD 45, PGCG, CGCG, and GCT of long bone cases could not be differentiated from each other. Doussis et al. have studied with similar group and similar markers in which they immunohistochemically analyzed GCT, giant cell granuloma, 5 cases of TB using CD 68, LCA, and HLA-DR. They found that strong positive membrane staining for LCA, and strong cytoplasmic staining for CD 68 in all the cases and presence of HLA-DR in cases of tuberculous granuloma. From the study, they concluded that these markers are useful in detecting the origin that the cell, which it belongs to the mononuclear phagocyte system. Similarly, assimilating the results obtained in our study, CD 68 and CD 45 expression was found in the groups, suggesting the origin from mononuclear phagocyte system. CD 68 and CD 45 are found to react with other cells, including mononuclear phagocyte system cells and macrophage polykaryons in CGCG, PGCG, and GCT and considering their clinical behavior of osteoclast type. Based on their clinical behavior, expression of CD 68, CD 45 and HLA-DR in tuberculous granuloma can be correlated to the time tested fact that epithelioid cells are modified macrophages along with the disease state. Thus, results from the present study in reference with few literature, it can be postulated that giant cells in PGCG, CGCG, and GCT share a similar origin. Hence, aggressiveness of the lesion can be primarily related to the stromal component of individual lesion. To conclude, the results obtained affirms that owing to the expression of CD 45 and CD 68 in these conditions, the giant cells in giant cell granuloma and GCT are derived from monocyte macrophage lineage-osteoclasts considering its clinical behavior, whereas in tuberculous granuloma they are retained with the macrophage lineage. The study also provides insight into the various controversies existing regarding the pathogenesis of CGCG and PGCG and also between giant cell granuloma and GCT, thus suggesting that the aggressiveness of the individual lesion may be attributed primarily to their stromal component. The present study also specifies the importance of high expressivity of HLA-DR in tuberculous granulomas which is an essential factor for presentation of the microbial antigen to CD 4 helper cells thus reassuring the fact that they are up-regulated in response to infection. Thus, this study is a near approach to determine various origin and nature of giant cells, bringing into limelight the antigenicity of the markers. Extensive research is required for imparting new concepts on the antigenic-phenotyping of giant cells. Chambers TJ. Multinucleate giant cells. J Pathol 1978;126:125-48. Creighton C. An infective form of tuberculosis in man identical with bovin tuberculosis. Virchows Arch 1858;14:177-216. Doussis IA, Puddle B, Athanasou NA. 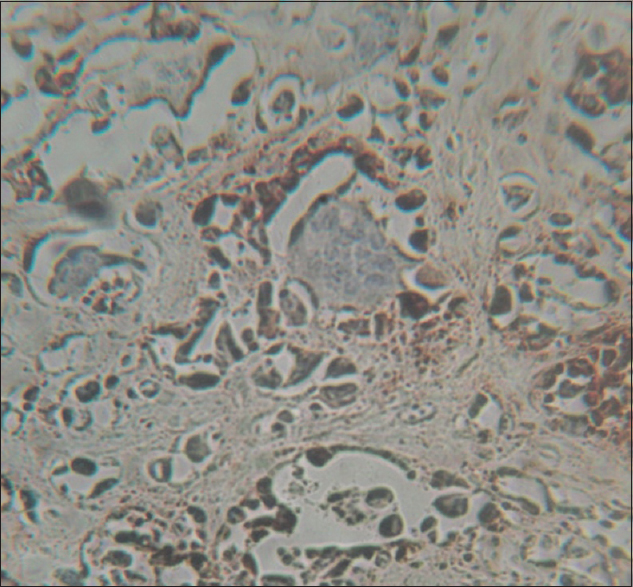 Immunophenotype of multinucleated and mononuclear cells in giant cell lesions of bone and soft tissue. J Clin Pathol 1992;45:398-404. Postlethwaite AE, Jackson BK, Beachey EH, Kang AH. Formation of multinucleated giant cells from human monocyte precursors. Mediation by a soluble protein from antigen-and mitogen-stimulated lymphocytes. J Exp Med 1982;155:168-78. Barbatis C, Kelly P, Greveson J, Heryet A, McGee JO. Immunocytochemical analysis of HLA class II (DR) antigens in liver disease in man. J Clin Pathol 1987;40:879-84. Gottfried E, Kunz-Schughart LA, Weber A, Rehli M, Peuker A, Müller A, et al.Expression of CD 68 in non-myeloid cell types. Scand J Immunol 2008;67:453-63. El-Mofty S, Osdoby P. Growth behaviour and lineage of isolated and cultured cells derived from giant cell granuloma of the mandible. J Oral Pathol 1985;14:539-52. Tiffee JC, Aufdemorte TB. Markers for macrophage and osteoclast lineages in giant cell lesions of the oral cavity. J Oral Maxillofac Surg 1997;55:1108-12. Liu B, Yu S, Li T. Multinucleated giant cells in various forms of giant cell containing lesions of the jaws express features of osteoclasts. J Oral Pathol Med 2003;32:367-75. Mii Y, Miyauchi Y, Morishita T, Miura S, Honoki K, Aoki M, et al.Osteoclast origin of giant cells in giant cell tumors of bone: Ultrastructural and cytochemical study of six cases. 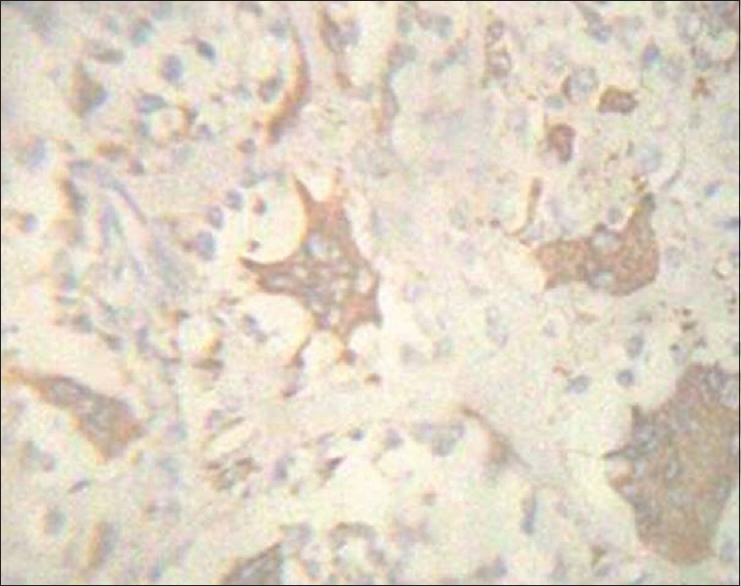 Ultrastruct Pathol 1991;15:623-9. Goldberg RD, Michelassi F, Montag AG. Osteoclast-like giant cell tumor of the pancreas: Immunophenotypic similarity to giant cell tumor of bone. Hum Pathol 1991;22:618-22. Athanasou NA, Wells CA, Quinn J, Ferguson DP, Heryet A, McGee JO. The origin and nature of stromal osteoclast-like multinucleated giant cells in breast carcinoma: Implications for tumour osteolysis and macrophage biology. Br J Cancer 1989;59:491-8. Lim L, Gibbins JR. Immunohistochemical and ultrastructural evidence of a modified microvasculature in the giant cell granuloma of the jaws. Oral Surg Oral Med Oral Pathol Oral Radiol Endod 1995;79:190-8. Brecher ME, Franklin WA, Simon MA. 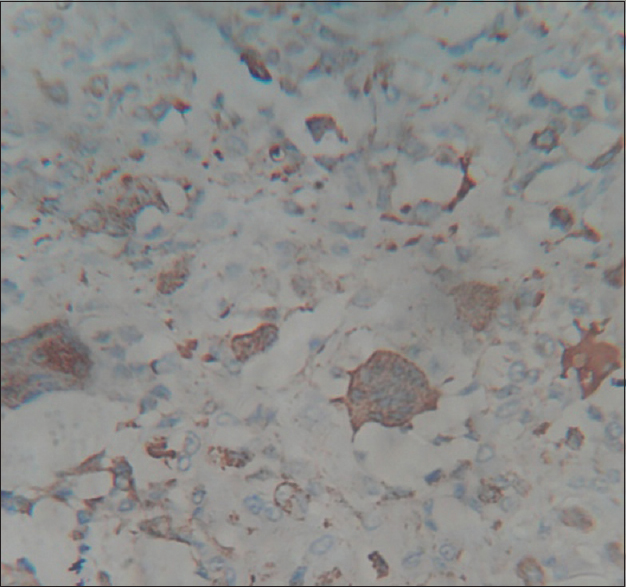 Immunohistochemical study of mononuclear phagocyte antigens in giant cell tumor of bone. Am J Pathol 1986;125:252-7. Flanagan AM, Chambers TJ. Osteoclasts are present in the giant cell variant of malignant fibrous histiocytoma. J Pathol 1989;159:53-7. Chambers TJ, Fuller K, McSheehy PM, Pringle JA. The effects of calcium regulating hormones on bone resorption by isolated human osteoclastoma cells. J Pathol 1985;145:297-305. Austin LT Jr, Dahlin DC, Royer RQ. Giant-cell reparative granuloma and related conditions affecting the jawbones. Oral Surg Oral Med Oral Pathol 1959;12:1285-95. 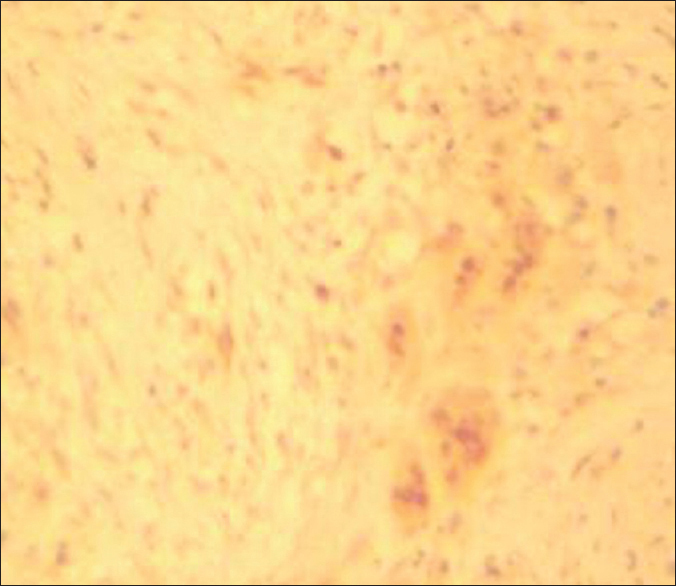 Hanaoka H. Ultrastructure and histogenesis of giant-cell tumor of bone. Cancer 1969;25:408. Auclair PL, Cuenin P, Kratochvil FJ, Slater LJ, Ellis GL. A clinical and histomorphologic comparison of the central giant cell granuloma and the giant cell tumor. Oral Surg Oral Med Oral Pathol 1988;66:197-208. Meng XM, Yu SF, Lu M, Zheng J, Han ZH. Expression of macrophage inflammatory protein-1alpha, a disintegrin-like and metalloproteinase 8 and 12, and CD 68 protein in giant cell lesions of jaw and giant cell tumors of long bone. Eur J Pathol 2005;34:393-6. Zarbo RJ, Regezi JA, Lloyd RV, Crissman JD, Batsakis JG. HLA-DR antigens in normal, inflammatory, and neoplastic salivary glands. Oral Surg Oral Med Oral Pathol 1987;64:577-84. Williams GT, Williams WJ. Granulomatous inflammation – A review. J Clin Pathol 1983;36:723-33. Zumla A, James DG. Granulomatous infections: Etiology and classification. Clin Infect Dis 1996;23:146-58. Barnes DS. Historical perspectives on the etiology of tuberculosis. Microbes Infect 2000;2:431-40. Sable SB, Goyal D, Verma I, Behera D, Khuller GK. Lung and blood mononuclear cell responses of tuberculosis patients to mycobacterial proteins. Eur Respir J 2007;29:337-46. Brahmajothi V, Pitchappan RM, Kakkanaiah VN, Sashidhar M, Rajaram K, Ramu S, et al.Association of pulmonary tuberculosis and HLA in south India. Tubercle 1991;72:123-32.